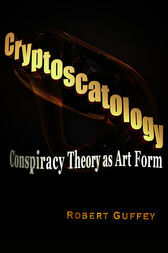 Examining nearly every conspiracy theory in the public’s consciousness today, this investigation seeks to link seemingly unrelated theories through a cultural studies perspective. While looking at conspiracy theories that range from the moon landing and JFK’s assassination to the Oklahoma City bombing and Freemasonry, this reconstruction reveals newly discovered connections between wide swaths of events. Linking Dracula to George W. Bush, UFOs to strawberry ice cream, and Jesus Christ to robots from outer space, this is truly an all-original discussion of popular conspiracy theories. Robert Guffey is a professor of English at California State UniversityLong Beach. His short stories and interviews have appeared in numerous publications, including After Shocks, Aoife’s Kiss, Art From Art, Catastrophia, and Chimeraworld. He lives in Long Beach, California.